Doomsday is nominally built around a theme of M.F. Doom’s planned revenge on the music industry for destroying KMD’s career, and incorporates several snippets from the 1967 Hanna-Barbera cartoon The Fantastic Four. In the episode “The Way It All Began,” Doctor Doom tells his origin story of conducting a scientific experiment that goes awry, making his face “hideous.” But there are other major themes, too, including the 1983 B-boy movie Wild Style and the 1960s Japanese comic-horror movie serial Godzilla. The latter provides inspiration for another Dumile alias, King Ghidra. Meanwhile, Monsta Island Czars references Monster Island, a locale in the debut issue of the long-running comic book Fantastic Four. 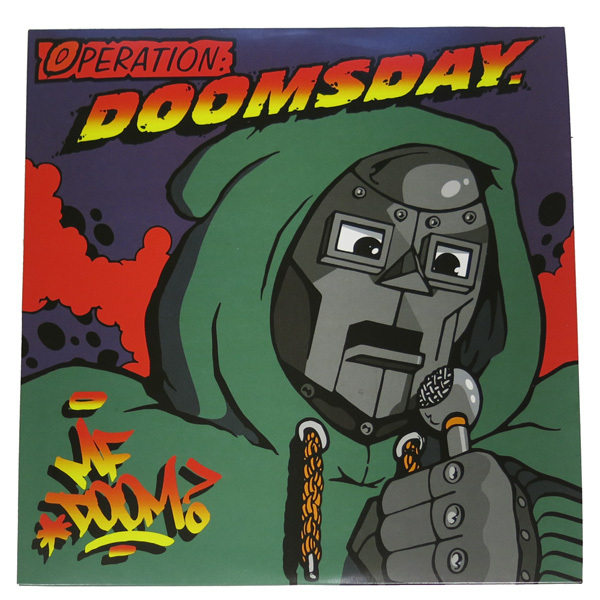 Operation: Doomsday has gone in and out of print since its 1999 release in spite of its immediate acclaim, which sparked a major career comeback for Dumile/Doom that continues to this day. This April, Stones Throw Records released a definitive two-disc edition that includes the original album plus alternate versions, instrumentals, and a cappellas. The occasion warrants a deeper look. Percy “MF Grimm” Carey’s career dates back nearly as far as Doom’s. Well-known on the New York battle rap circuit, he first appeared on KMD’s album Black Bastards, and then released an underground 12-inch, “So Whatcha Want N*gga?” Soon after that, he was shot and paralyzed for life. In and out of lockup for various charges, Grimm’s breakout moment came on Doomsday when Doom gave him the solo showcase “Tick, Tick…” The next year, the two collaborated on the MF EP, which features the excellent track “No Snakes Alive.” Grimm went on to found a successful indie label, Day By Day Entertainment. In 2007, he authored a harrowing graphic novel for DC Comics, Sentences: The Life of MF Grimm, which won several comic industry awards. The expanded box set edition of Doomsday includes “I Hear Voices Pt. 2,” where Grimm details a bout with schizophrenia while in prison.